I've been doing a lot of fall projects lately (like this, this, and this), but I've decided that I need to switch gears and start thinking about Halloween. I started working on this printable almost three weeks ago, and although I absolutely love the result, boy am I glad it's finished! 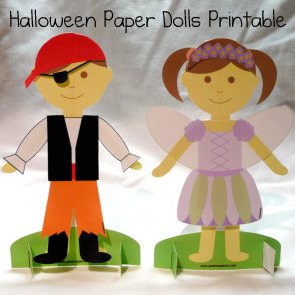 So without further ado, I present to you a set of Halloween paper dolls! There are two dolls: one boy and one girl. There are six costumes: a boy superhero, a girl superhero, a pirate, a fairy, Frankenstein, and a princess. Aren't they cute? You could also use these paper dolls for scrapbooking! 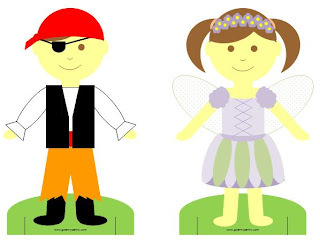 Click HERE to download the Halloween Paper Dolls PDF. NEW in 2011: Find a black and white "color your own" version HERE! Instructions: Print on white cardstock at 100% (no scaling). Carefully cut out each paper doll, base, and costume. Cut slits in bases on solid black lines. Fold stand bases on dotted line. Match up slits in doll bases and stand bases to assemble. 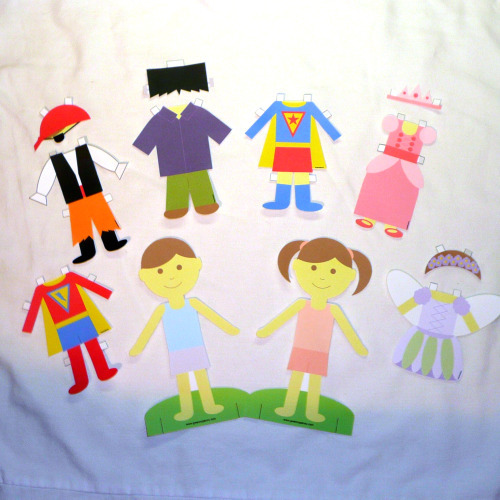 Fold back all costume tabs to dress dolls. After I finished the designs and printed them, I was faced with the task of cutting them out. 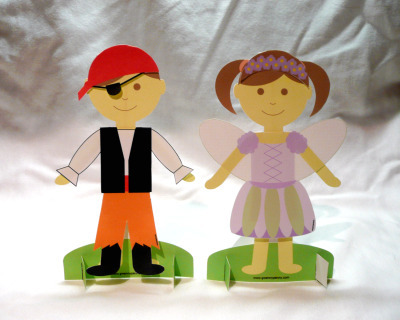 Even though I specifically designed these dolls and costumes to be scissor friendly, I was dreading it. I timed myself, and it only took a little over 20 minutes! I was expecting at least an hour, so I was very happy. Also, I wanted to give you a tip...my cardstock was a little flimsy, so I added a craft stick to the back of each doll to stiffen them up a bit. Hope you enjoy the paper dolls! My three year old can't wait to get her hands on them this morning. Thanks for stopping by! This are absolutely adorable. I'm going to get some white card stock so Hailey and Jacob can have a set. Gwen-those are so stinking cute! I'm going to print some out for our trip to disneyland-they'll be perfect for a car toy! Thanks! These are so adorable. I love them!! Wow, these are really great! I love your creativity and thank you so much for sharing your printable with us!! Sooo cute!! I love the little pirate costume! 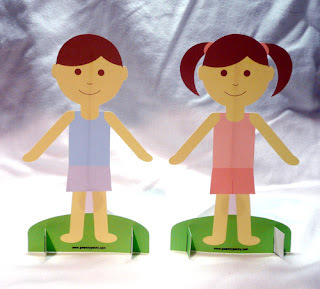 My sister and I had paper dolls that were barbies when we were little and loved the portability of them!! SOO CUTE! I love them! These are so cute, love all the costumes. Oh my goodness! Thank you!! My four-year old is going to loooove playing with these! Thank you so much these are darling! My kids are going to love them. These are adorable!!! 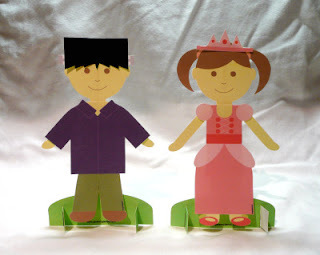 I LOVED playing with my paper dolls when I was a little girl!! I love you forever. 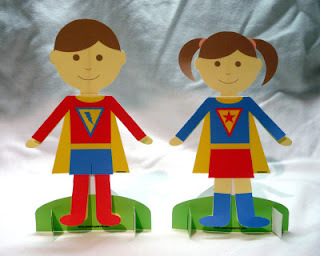 After last Sunday's unreverent church meeting, I was just thinking that I'd like to find some paper dolls for my little girls (Dad sit up on the stand during services and not with us). Thank you, thank you! They'll love the costumes for their dolls. Adorable! Can't wait to print them out and let my guy start playing, especially since he's already chosen to be a superhero this year! These are wonderful! My four year old is in love with them and hasnt stopped playing with them since I printed them out yesterday! Thank you thank you! 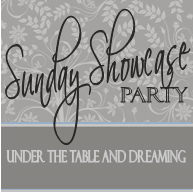 I am featuring you on my blog this Saturday, 10/9. These paper dolls are too cute! I featured them on my blog today! 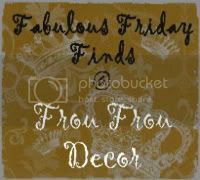 Thanks for the inspiration & have a fabulous weekend! These are ADORABLE! 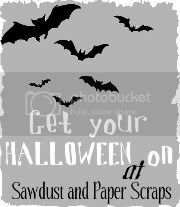 If you get a chance, I hope you'll come link them to my Halloween party this weekend! What a fantastic set of paper dolls! These are darling.! Thank you! Thank you for sharing such a darling design. Will be printing soon! These are so cute, but my daughter would easily rip them. I think I will print them out and run them through my Xyron machine with a magnet cartridge. They would be fun to dress up on the fridge or on a cookie sheet. Very cool printable. Now, I'm planning to create my kids costumes so they can dress up their dolls like themselves this Halloween, too.